On Broadway, Wicked grossed $1,830,739 with 100% attendance rate for the week ending June 26, 2011. The 30 shows on the boards grossed $23,765,758, increasing nearly 4% from the previous week’s totals. Wicked will be returning to The Buell Theatre, Denver in April 2012. Denver Center Attractions has announced a high-spirited, award-winning season of Broadway hits headed to Denver, Colorado. The 2012 season includes the return of Wicked, the 2010 Best Musical Tony Award winner. Wicked will be playing at The Buell Theatre from April 11 to May 20, 2012. Winner of 35 major awards, including a Grammy and three Tony Awards, Wicked is Broadway’s biggest blockbuster, a cultural phenomenon and was just named “the defining musical of the decade” by The New York Times. Buy Wicked Denver Colorado Tickets Online for better seats before they all go on sale. Use Code AFF$10 to Get $10 OFF on Wicked The Buell Theatre Ticket Orders over $350! According to TicketNews’ exclusive weekly events rankings, Wicked was the hottest selling event on the secondary market for the week ending Sunday, June 12. Power scoring a 3.88, the popular Broadway production made it back to the leader position after a five week absence. In Top Theater, “Wicked” led the list with a solid power score of 20.99, followed closely behind by “The Book of Mormon” (two, 16.79). At three was Les Miserables (6.06), “Jersey Boys” took four (4.92) and “War Horse” finished the week at five (4.73). Yet another Cirque production made it beyond the Vegas rankings, with Alegria in at six (3.55), followed by Billy Elliot (seven, 2.94), “Lion King” (eight, 2.67), Cirque’s “Zarkana” (nine, 2.67), and West Side Story (ten, 2.60). Joe Mantello’s stage production of Wicked is a suspenseful story about appearances versus reality, and doing the right thing as opposed to what is popular. Wicked is currently performing at Queen Elizabeth Theatre and playing thru Sunday, June 26, 2011. Elphaba (Anne Brummel) and Glinda (Natalie Daradich) form an unlikely friendship on their journey to becoming the Wicked Witch of the West, and Glinda the Good. Elphalba is gregarious, gifted, and green, while Glinda is pretty, petty, and popular. The two friends come to a collision course as they fall in love with the same man (Fiyero, played with easy charm by David Nathan Perlow) and find themselves on the opposite sides of a political struggle. At the show’s opening, the elaborate set lit up with an enormous dragon that stretched the width of the stage, and Glinda the Good gliding down in an enormous silver bubble. It’s present day, the wicked witch has been melted (not a spoiler if you’ve seen the Wizard of Oz) and Glinda has some questions to answer. The story then jumps back in time to how Glinda and Elphaba first met, before either was born, then slowly forward to present day: moving through schools, the Emerald City, the palace of the Wizard of Oz, and the hideaway where Elphalba organizes a rebellion against the corrupt government. The stage design is breathtaking, with large mechanical props, flying monkeys dangling from wires, alternating indoor and outdoor sets of schools, dorms, parks, and dungeons. With flying monkeys, wizards and witchcraft, talking goats, the set recreates the universe from Maguire’s book. The animals are a key part of the Wicked drama: highly intelligent creatures, the animals in Oz are capable of speech and have no human masters or owners. Authorities, however, are working to robbing the animals of their speech capability and spreading the idea that animals are to be kept in cages. Brummel is convincing as Elphalba, defiantly defending the animals in Oz, even as her activities lead her to be ostracized as the “wicked” witch of the West. Daradich was excellent as Glinda, who struggles with her desire to support her friend yet also keep her social status and popularity. Audiences are kept on edge whether Glinda help her friend, or continue being “good” merely in the eyes of the public. Fans of the book may be disappointed to see that the musical often deviates from the original story. Some of the basic plot points remain in tact, but the political edge has disappeared, the characters are far more light-hearted. The relationships between the characters and their histories have been altered or mixed up, and wraps up with a crowd-pleasing ending — Glinda and Elphalba are happily reunited, with Glinda becoming the new ruler of Oz. It’s a big departure from the original story, which shows Elphalba’s near-certain death at Dorothy’s hands. Buy Wicked Queen Elizabeth Theatre Tickets Online for better seats before they all go on sale. Use Code AFF$10 to Get $10 OFF on Wicked Vancouver, BC Canada Ticket Orders over $350! After breaking box office records and selling out in record time in 2009, Wicked, Broadway’s biggest blockbuster will return to Nashville’s Tennessee Performing Arts Center, October 19 through November 6, 2011. Tickets for the return engagement go on sale at 10 a.m. Friday, June 17 and are available at the TPAC box office at 505 Deaderick Street (downtown) or the new Satellite box office in the Mall at Green Hills, located at the mall’s concierge desk, near J. Crew and Express. Wicked will play at TPAC’s Andrew Jackson Hall from October 19 to November 6, 2011. Buy Wicked Nashville TN Tickets Online, Use Code AFF$10 to Get $10 OFF on Orders over $350! Wicked will be visiting Peoria, IL for 24 performances from October 12 to 30, 2011. New season tickets for the Peoria Civic Center’s 2010-2011 Broadway Theater Series go on sale Monday, June 6, 2011, at 10 a.m. at the Peoria Civic Center Box Office or by phone at 309-673-3200. Season ticket holders receive the first opportunity to purchase the best available seats, discounts on ticket prices, and advance notice on theatrical events at the Peoria Civic Center. Patrons that visit the Peoria Civic Center Box Office to purchase their new season tickets between 10 a.m. and noon on June 6 will be able to take advantage of one-on-one personal service with Civic Center Box Office staff and complimentary light refreshments. The season kicks off with Wicked on October 12-30, 2011, with 24 performances. On Broadway and around the world, Wickedhas worked its magic on critics and audiences alike. Winner of 35 major awards, including and Grammy and three Tony Awards, Wicked is “Broadway’s biggest blockbuster” and “the defining musical of the decade” (The New York Times). Buy Wicked Peoria IL Tickets Online. Use Code AFF$10 to Get $10 OFF on Wicked Peoria Civic Center Theatre Ticket Orders over $350! We hope that you enjoy your Wicked experience. Dee Roscioli joins the cast of Wicked as Elphaba on Tuesday June 7 at the Orpheum Theater in Omaha, NE. She recently completed her run as Elphaba in “Wicked” on Broadway, after closing the record-breaking Chicago production and performing the role in San Francisco. Wicked runs through June 12 at the Orpheum Theater. 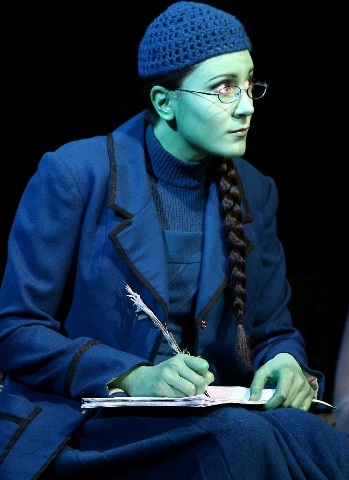 Roscioli has played Elphaba in more performances than any other actress – more than 1,000 performances and counting. She recently completed her run as Elphaba in Wicked on Broadway, after closing the record-breaking Chicago production and performing the role in San Francisco. Additional NY credits include The 24-Hour Musicals, Therapy Rocks (NYMF). Nat’l tour: Cats (Grizabella). She recently did a workshop of Bobby Cronin’s Welcome to My Life, and Liberty. The company also features Justin Brill (Boq), Stefanie Brown (Nessarose), Colin Hanlon (Fiyero), Paul Slade Smith (Dr. Dillamond), and Mariand Torres (Standby for Elphaba) with Lauren Boyd, Rick Desloge, Emily Ferranti, Melanie Field, Luis Augusto Figueroa, Dominic Giudici, Napoleon W. Gladney, Brenda Hamilton, Spencer Jones, Renee Lawless-Orsini, Philip Dean Lightstone, Marissa Lupp, Corey Mach, Yanira Marin, Sterling Masters, Alli McGinnis, Kevin McMahon, Christopher Russo, Adam Sanford, Adea Michelle Sessoms, Carla Stickler, Brandon Tyler, Shanna VanDerwerker and Bud Weber. The Omaha engagement of WICKED is currently running through June 12 at the Orpheum Theater. Good seats are still available. Buy Wicked Omaha NE Tickets Online. Use Code AFF$10 to Get $10 OFF on Wicked Orpheum Theatre Omaha Ticket Orders over $350! We hope that you enjoy your Wicked experience.